Two of the nation’s top lacrosse programs return to Southern California to showcase one of the game’s biggest rivalries in the Sixth Annual Pacific Coast Shootout. Denver and Notre Dame will square off on Saturday, March 9 at 7:00 PM (PST) at Orange Coast College in Costa Mesa, CA. 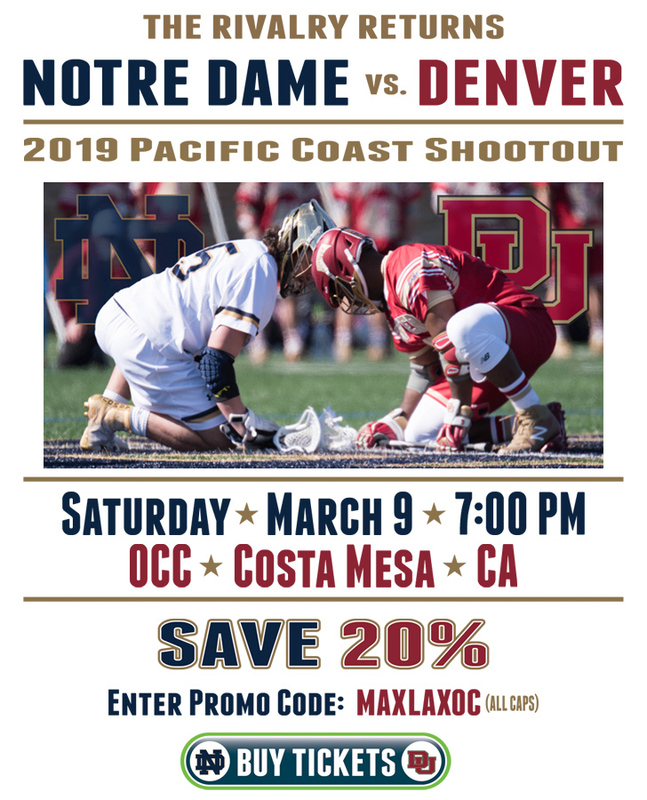 This year’s appearance in the Shootout will mark Denver’s second and Notre Dame’s third time playing in Orange County. The Pioneers and Irish met in 2014 in the event’s inaugural game, where Denver beat Notre Dame 10-7. Notre Dame appeared again in the 2016 Shootout, beating Maryland 9-4. The Notre Dame-Denver series is among the most competitive, closely contested rivalries in all of college lacrosse. In addition to their regular season battles, the Irish and Pioneers have met three times in the past four years in May in the NCAA tournament.